Can you imagine the life of mankind in the whole world without electricity for a month, a week or just a day?! One day without computers and TVs, all electronic gadgets and household appliances, fridges and conditioners and simply light? Electricity is such a necessity of everyday life and plays a very important part in contemporary life but most of us take it for granted. Considering the fact, that electrical wiring is the core of all efficient electrical systems. It is a complex process of an installation of cabling and related devices like electrical outlets and switches, light fittings and distribution boards in a structure. Wiring is a subject of safety standards for correct design and appropriate installation. Appropriate wire and cable types and sizes are specified according to the circuit operating voltage and electric current capability, with restrictions on the environmental conditions, such as moisture levels, ambient temperature range, exposure to sunlight and chemicals. In addition, improper or faulty wiring installation can be dangerous or even deadly, since the possible risks include electric shock and death, fires, shorts, device overheating, property damage and catastrophic system failure. 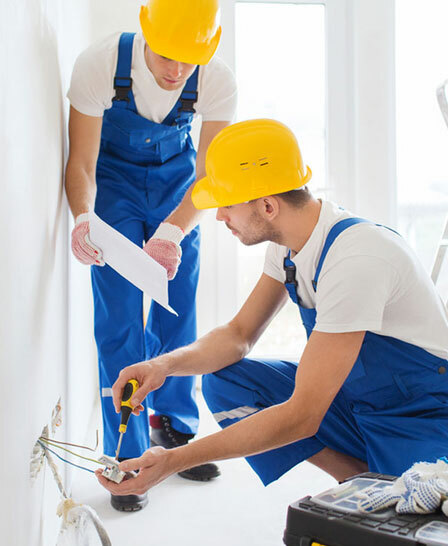 To fix problems, to install electrical wiring and maintain components of electrical system in Toronto and the GTA is best to trust qualified and certified electrician like the professionals at House Renovations company. Our specialists have the appropriate expertise needed to replace wiring in old house, to install a breaker panel or an outlet box, to change basement lights or remodel ceiling lights, to select the right wires for the different applications inside or within your building in Toronto and the GTA. Our surpassing team can detect wiring problems in your existing electrical wiring system even in hard-to-reach parts of the building using such advanced technology as thermal scanners. Our close attention to details ensure that we don’t miss a thing and take all the right steps with your electrical infrastructure and make sure it meets current safety standards. We specialize in all types of residential and business projects. 24-Hour Emergency Service. Our technicians are on-call 24/7 in Toronto and the GTA. Clear indications on the working process and commitment to deadlines. Upgrading of electrical appliances should be done with upgrading of the wiring to match. Worn-down and old wiring can cause hazard of shortcuts and fires. In case of sustained water damage, it is necessary to prevent corrosion and fires. most modern electrical devices are not compatible with aluminum wiring. All you need to do is to give us a call today and we will take care of any kind of wiring.